Birthdays are a special time in a person's life and are cause for celebration. with a personalized historical greeting. all the significant events of that special day and year in history! unique and thoughtful way of saying thanks for their business! Treasured Past greetings improve customer relationships and generate loyalty. They have a retail value of $5.95, but your cost is as low as $0.60! 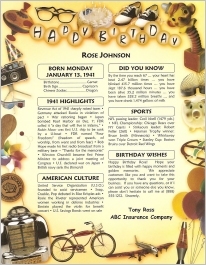 Nostalgic and Vintage Greetings are 8½" X 11"
Retro Card is 5½" X 8½"
If Treasured Past mails directly to your customers, we use envelopes with 2 windows. One window displays the customer's name & address and the other window displays your return name and address. If greetings are shipped in bulk to the person ordering, we include plain white envelopes for each greeting (no windows). The greetings are not inserted into the envelopes. You can add additional materials like coupons, business cards, surveys, etc. History for every day of the year — including February 29th! See Greeting Options above for exact categories per greeting style. Year In Review: Premier headlines of the year. Movies and Music: Best Actor and Actress, Top Movies and Songs. Sports: Trivia for the enthusiast. Then and Now: Price comparisons of housing, gasoline, food items, and more! 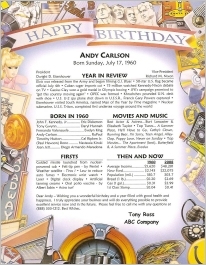 This Day in History: Highlights for the day, regardless of the year; includes famous people born this day in any year. Firsts: Inventions, new products and discoveries made during the year. American Culture: Fun, factual and nostalgic tid-bits, e.g., Mood rings appeared, Hula Hoops were popular. Entertainment: Interesting items from the world of Broadway, television, radio and literature (no information duplicated in the Movies and Music category). Born This Year: Famous people born any day that year. Did you know: Average quantities and calculations for the recipient's current lifetime e.g., heartbeat, hours slept, gallons of milk consumed. Treasured Past has been in business since 1998. Treasured Past's unique historical database has been used to mail over 1 million greetings. We guarantee complete satisfaction of your order. Copyright 2008 - 2019 Treasured Past Inc.